“It’s gone again, that beautiful summer, that summer that started back in May! Ah, you thought there would be no end to it, but before you know it, that summer will be long gone.” A Dutch song from 1973. I can remember that one as if it were yesterday. 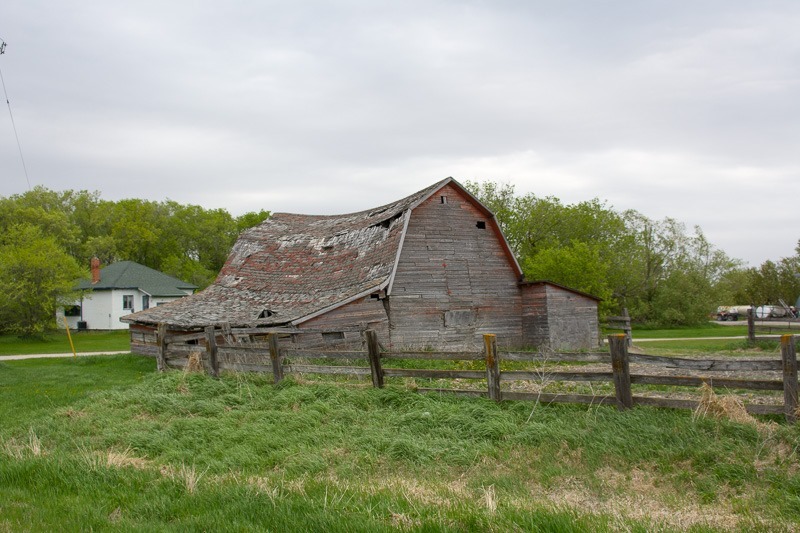 Well, perhaps last week… In Manitoba, we can say the same thing: Summer’s gone. Fall will set in and colour the landscape in red and gold. So before fall really sets in with cold and misty weather, let’s take a good look at what we did this summer. It seems like we have had no time to do anything and it only started last week. But last week the weather was still nice and hot. As well as the week before that, and before that one too . Time goes faster and faster. Should I go on and lament more about a gone summer? No, I don’t think so. Not more than complaining about bad roads in Winnipeg, they get taken care of, one section at a time. Late spring was in May, the first birds came back to settle in the area after the cold. Ducks come back in nearly unlimited numbers. Most people will call everything on the water a “duck” but in fact there are quite a lot of differences between the birds. 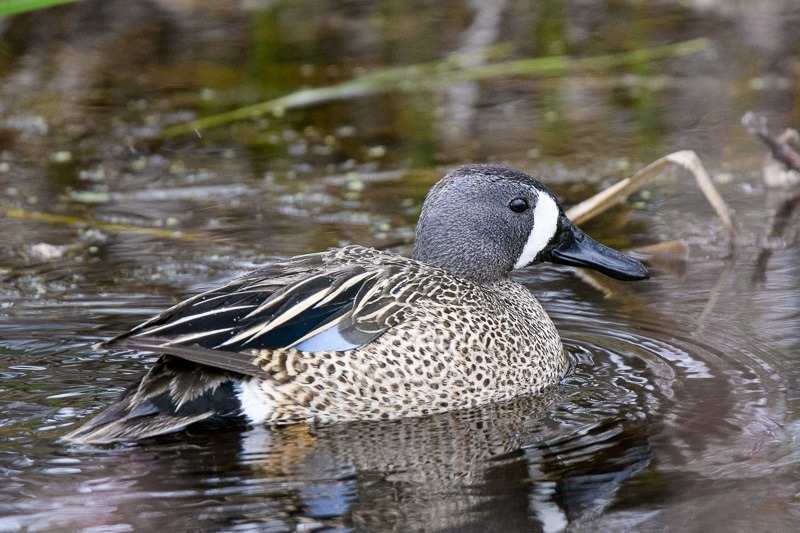 A Blue-Winged Teal, that’s what this is. Not a “duck”! 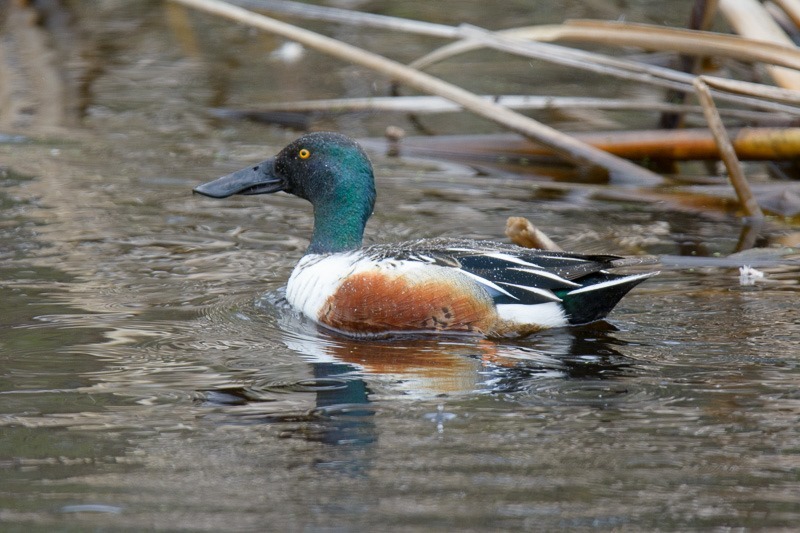 This one is a Northern Shoveller. Always too late, arriving in spring when my driveway doesn’t need shovelling anymore. The first ones to arrive are the hardier birds, ones that can still resist a bit of snow and ice if need be. After that, the songbirds arrive, making sure that there is no more ice and snow coming. These birds indicate that summer is really on its way in. 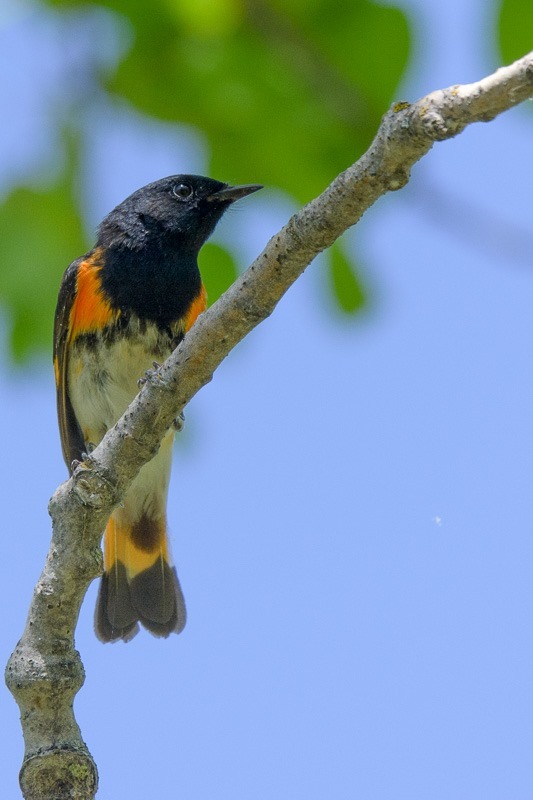 American Redstarts like the one above like their warm weather. But many of the birds simply move on further north. Migration season is then mostly over. I won’t post all of the birds here that I caught this year, too many of them. However, after the birds, it seems that there is nothing more to photograph. Lots of people I know then put their cameras in the closet and forget about them until fall migration. I prefer to continue to go out and shoot something else. If no subjects present themselves, move on to subject choice #2. Abandoned buildings. At least they won’t move, except perhaps down towards earth. 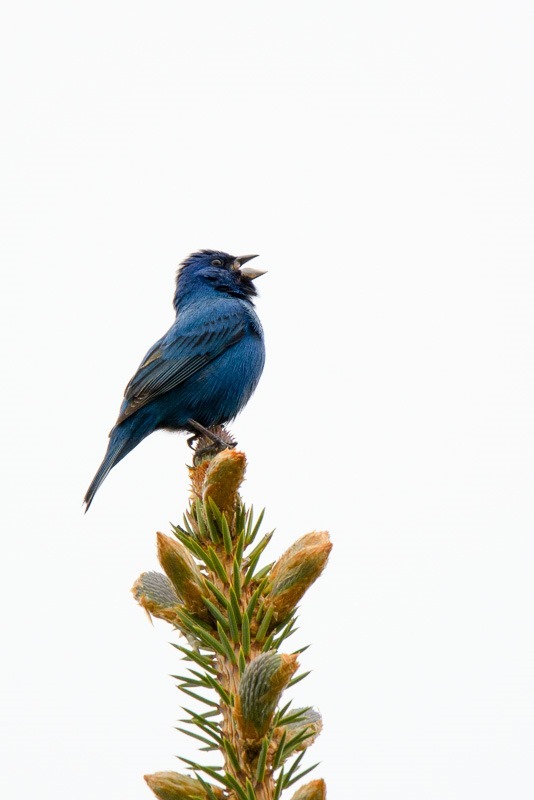 Oh, yes, some birds do decide to stay in the region, like this Indigo Bunting, part of the sparrow family. 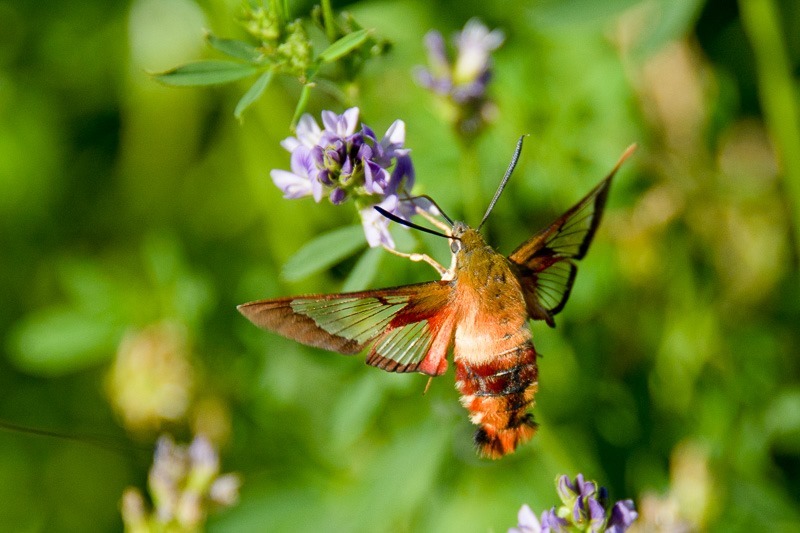 Even if it is in the area, it is notoriously difficult to catch. I guess that there are too many predators around for this bird to be sitting quietly on anyone’s porch. And then it’s really done with the birds. 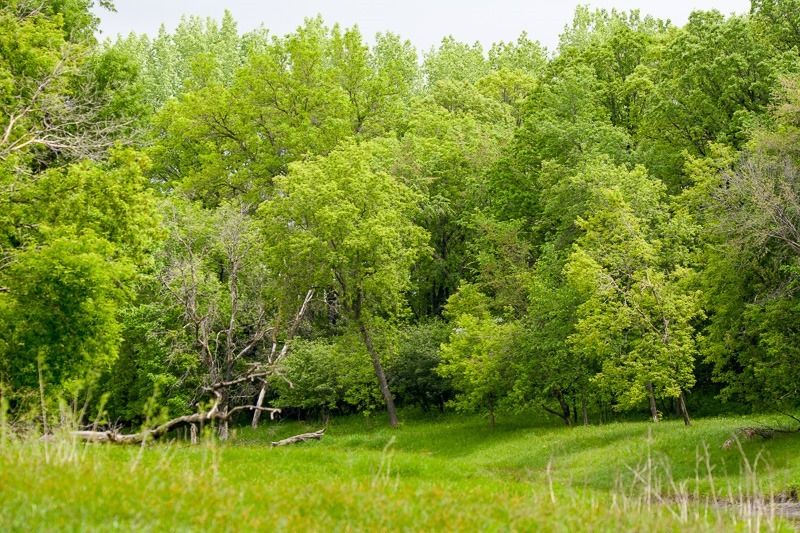 June arrives and green is here to stay. The above picture would make for a pretty difficult jig-saw puzzle. Who knows will I make one out of it one of these days. But shooting trees… does that mean there is nothing else to shoot? 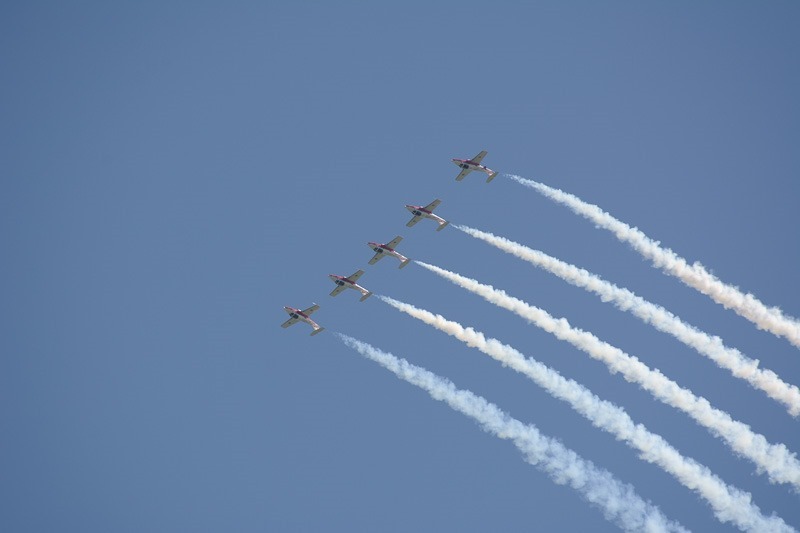 Nope, a much awaited airshow came to the province after a more than 10 year absence. Above, the Canadian SnowBirds. A pro team from the Canadian Air Force that show off their skills in their jets. Among others, of course. A show that I will remember for quite some time. But this summer was not without some rainy and overcast days either. Hoping for a great sunset over Lake Winnipeg we went a little bit up north. My wife wanted to go fishing, so I thought we’d both get what we wanted. Fish and Sunset. That evening both subjects decide to evade us as much as possible, no fish and no sunset to speak of. Back to shooting nature. This time the flowers have started to show off and some of them are really pretty. 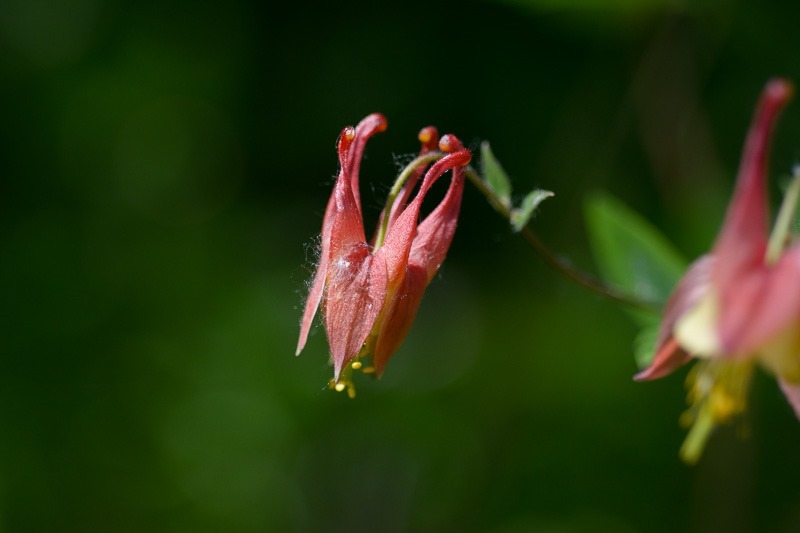 This wild Columbine is always a great subject to shoot. It takes its name from Colombine, an amusing clown, in the same troupe as Pierrot the sad clown. Sad because his love, Columbine leaves him usually for Harlequin. All of them can be enjoyed in the Commedia dell’arte. So what’s next? A museum, of course! The Threshermen’s Museum in Winkler with the Manitoba Foto Friends, no less. Another throw-back in time for me. 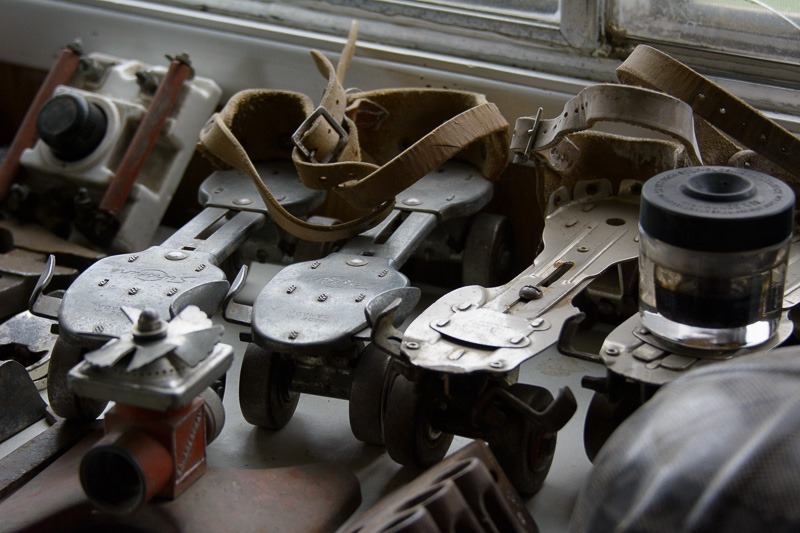 The above roller skates are like the ones I used to ride when I was a kid. No inline skates or anything of the kind. No, these roller skates could really mess up your ankles. Your feet were always flat on the ground, however wide your legs were apart. It cost many trousers (at the knees) and shoes (at the toes, scraping over the ground). Going out again, this time in some overcast-to-rainy weather. 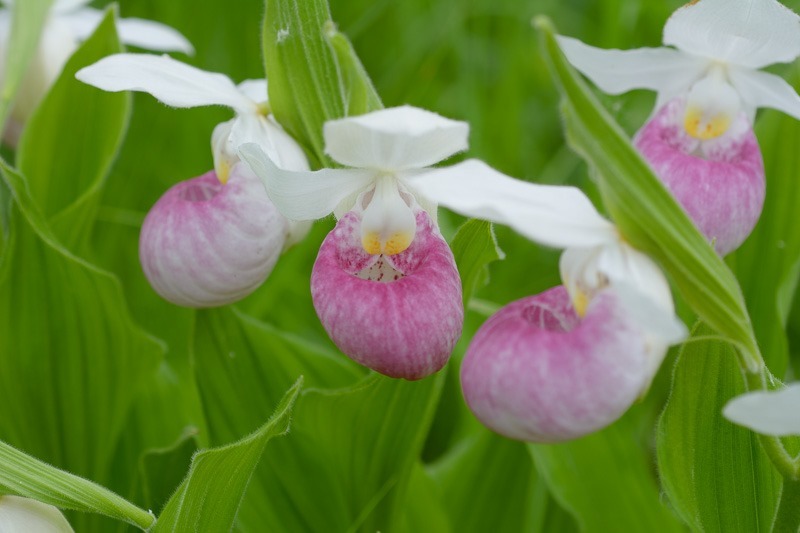 These Showy Lady slippers do not like the full sunshine. They prefer to bloom in the more shadowy parts of marshy areas. This year there were lots of them around, unlike previous years where I couldn’t find a single one of them. Perhaps I didn’t look close enough either, who can tell? 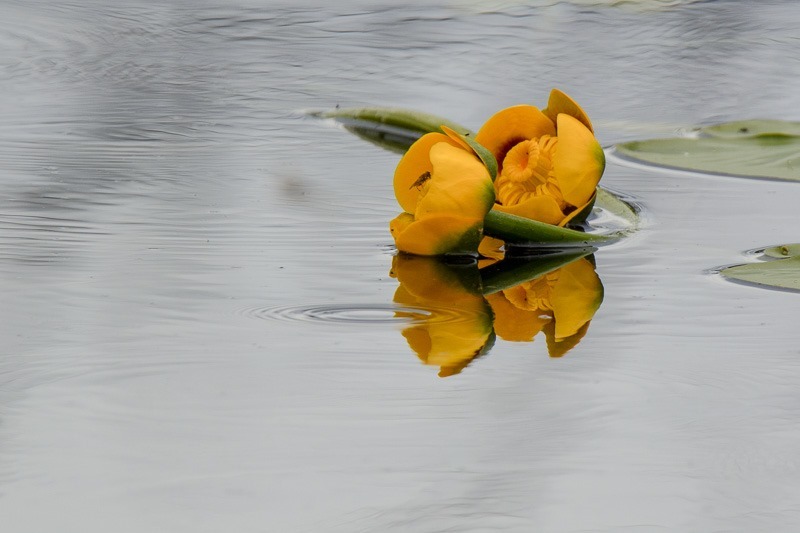 In the same trip, the Bullhead lilies were also great to shoot. A little rain made for some nice waves in the otherwise gray water. Did you spot the insect on this one? Sometimes you just have to get lucky with a shot. 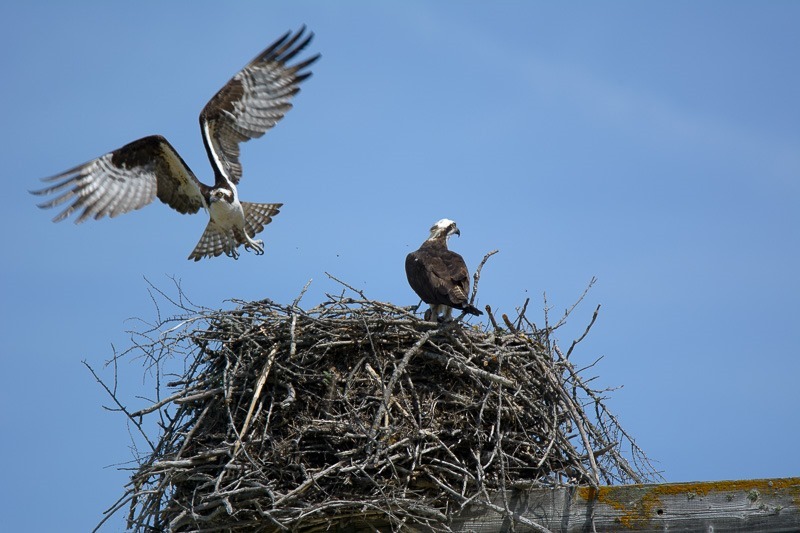 Now we are already in July and the first of the Osprey have their offspring in the nest. Here, dad takes off, almost within seconds of arriving. What he brought was not to the taste of Madame, who through it over the side of the nest once Monsieur had taken off for more food. I had never seen that. Year after year, this nest is growing and accommodating the same couple again and again. 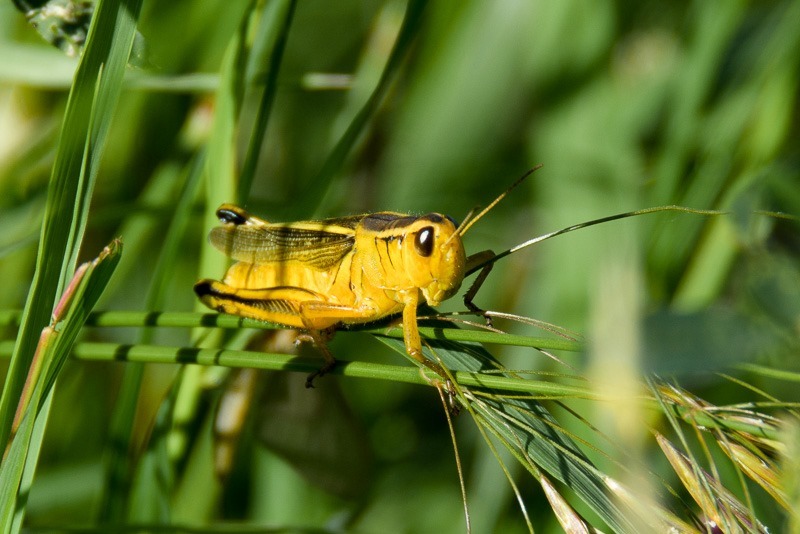 The other insect I found was this grasshopper. I tried to find an identification for it, but of course failed. I missed the yellow Swallowtail Butterfly, it took off before I had my camera ready. Talk about speed. 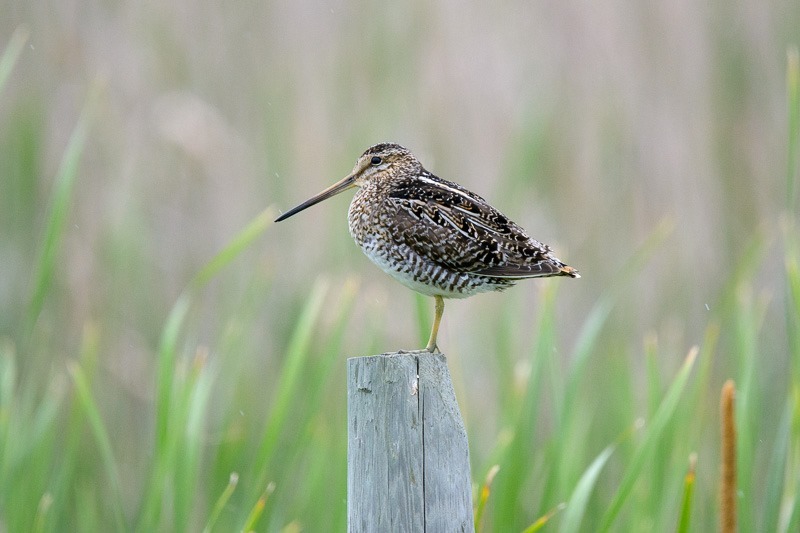 Snipes, and more exactly, Wilson’s Snipes were a first for me this year. This one conveniently stayed on a fence post to be photographed, the others I saw were perched on hydro lines. Birds and hydro lines no longer go together in my book, at least not to be presented, more as an ID kind of picture. 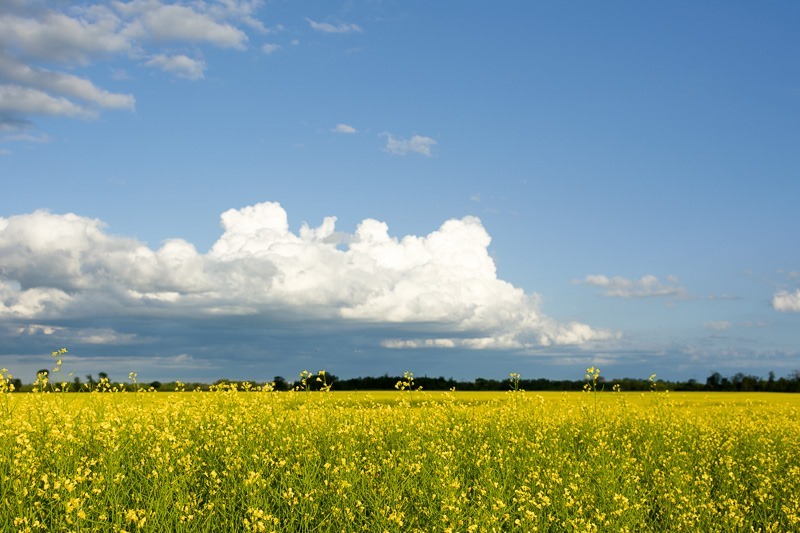 Summer continues its progress and the canola fields are now in full bloom. 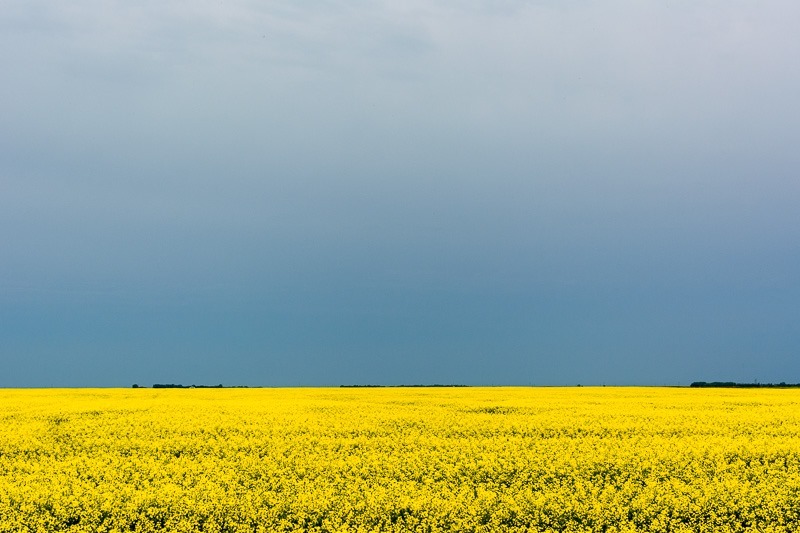 The bright yellow contrasts with almost everything and the smell is overwhelming in the fields. That just begs to be shot. Even better if the sky is a dark looming overcast sky, ready to unleash the heavy storms the Canadian Prairies have a reputation for. A dark sky is fine, but a sky with fluffy Cumulus Clouds is even better. Waiting for the storm to pass by is easy. Just wait five minutes and the sky will be different. But some of the storms will dump a lot of rain on everything. Some animals may become overwhelmed and end up beside the road. This Short-Eared Owl was sitting beside the road, unable to fly because of soaked feathers. 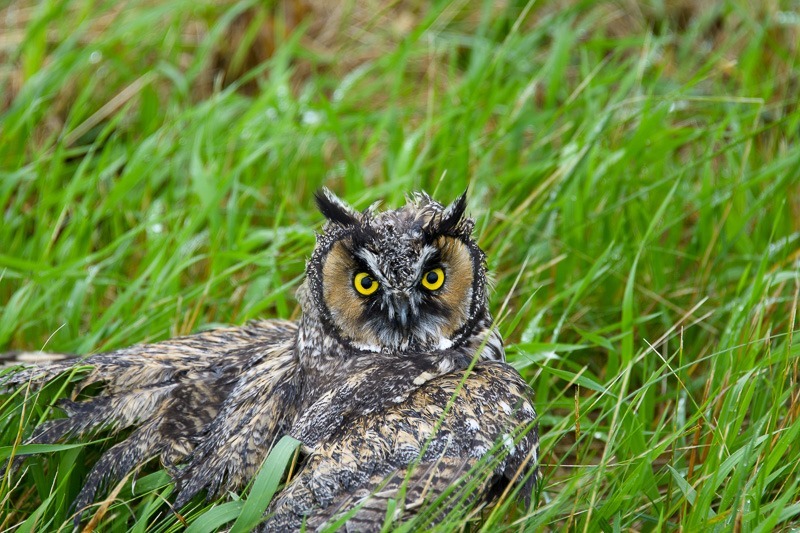 The same feathers that allow owls to fly virtually without a sound, allow for rain to sometimes soak them. That makes that the birds are stuck to the ground until they dry up. We rescued this one an brought him or her to the park rangers who took it to a shelter. There seemed to be nothing wrong with it, except for being completely wet. 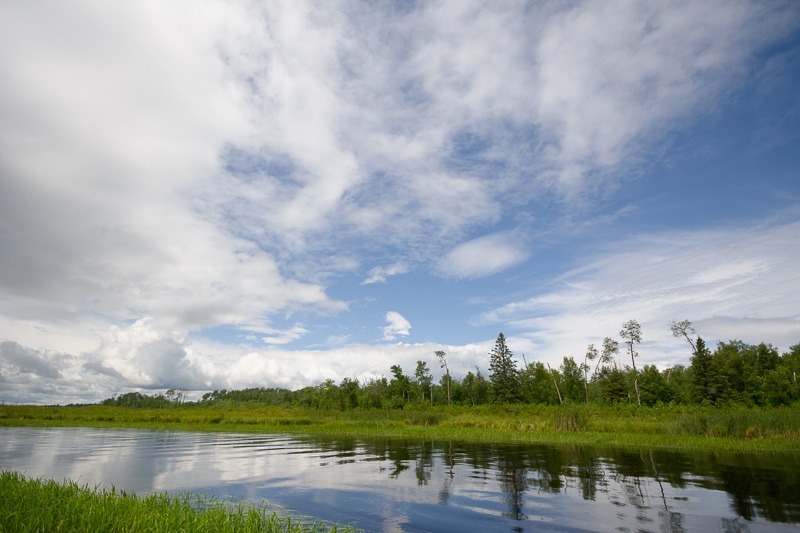 A trip on the Winnipeg River in the Whiteshell Provincial Park was a nice change from driving through the park. If those trees had been palm trees, I could have sworn we were in some South-east Asian country instead of Manitoba, Canada. Why? Well because the greens you see in the foreground is wild rice. I never knew that rice would grow so far up north. 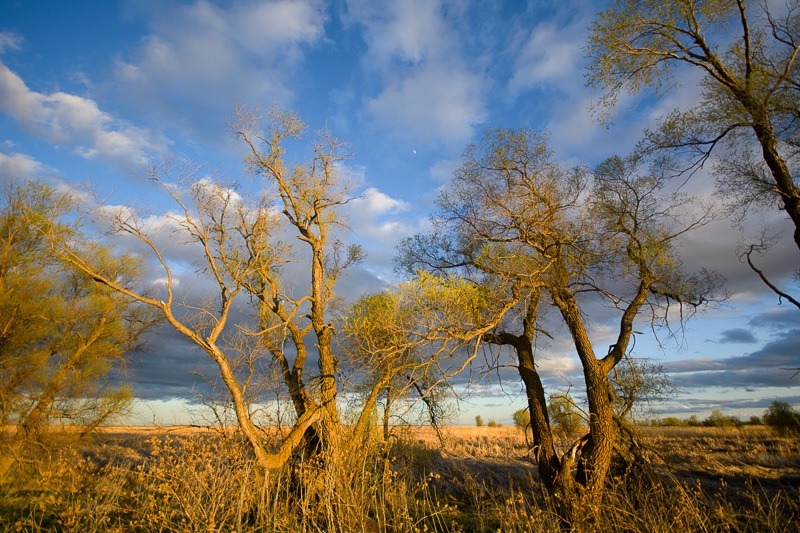 It is harvested by the First Nations, who have exclusive rights to this natural resource. 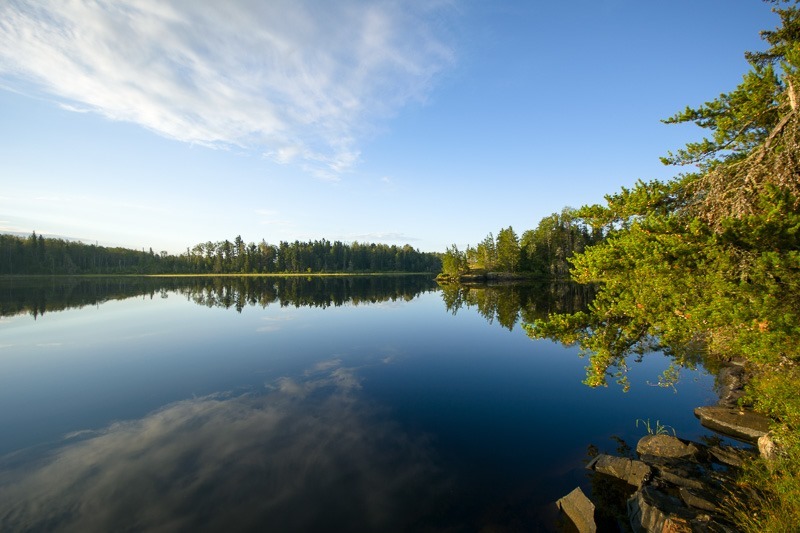 The same day, the trip in the boat lead over a small lake. 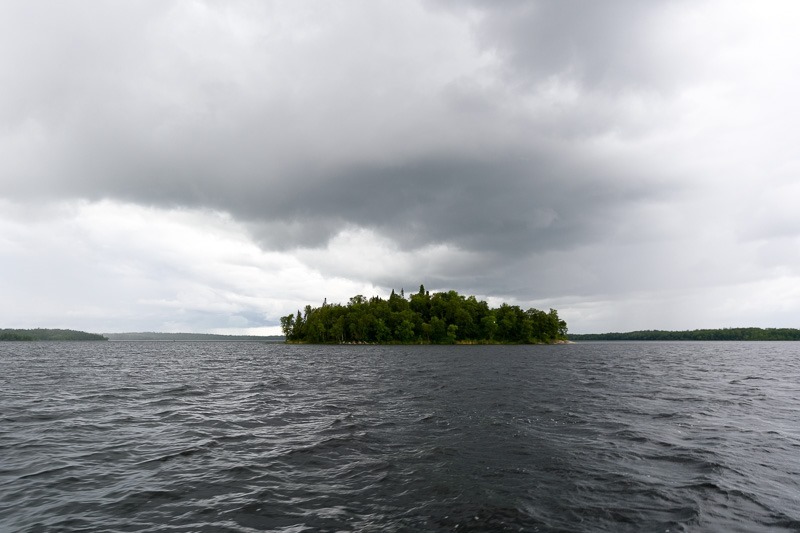 One Island is what you see in the distance, and overhead, well, more of the leaky clouds that had already soaked my clothing and gear. The otherwise calm Winnipeg River was now completely overloaded with water. 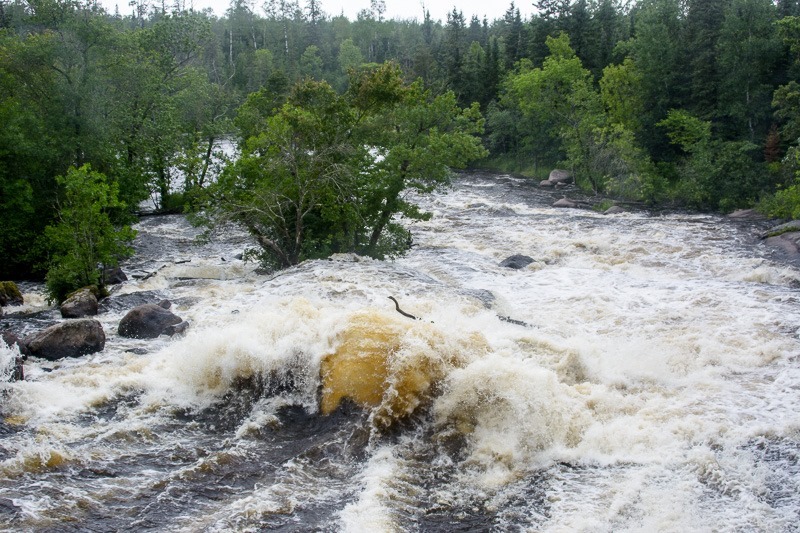 Can you imagine that on the bedrock underneath this roaring flood are age-old sacred carvings? Neither can I. I guess I will have to go back there in a drier period of the year. Then a storm hit. 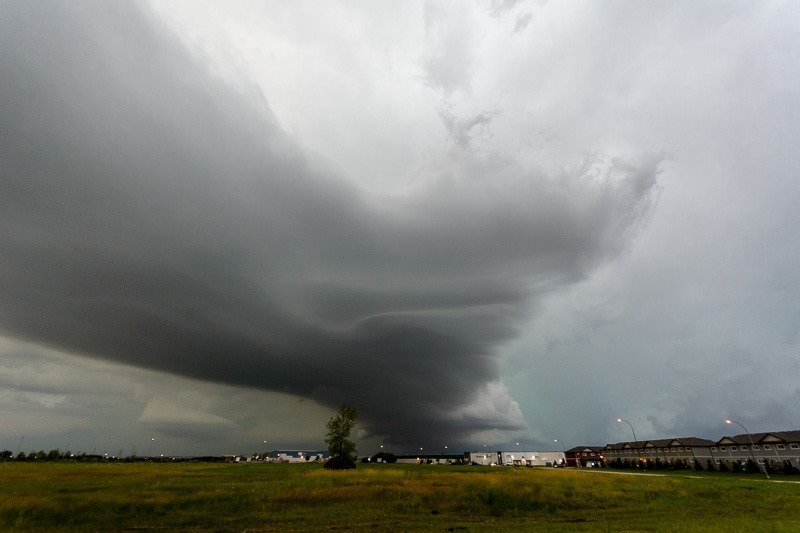 Not just any storm, this one must have had funnel clouds in it at some point. 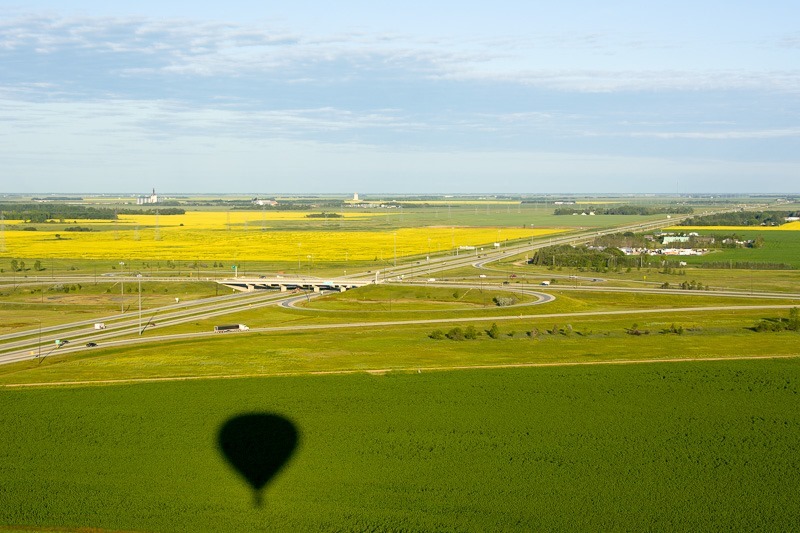 Wind speeds of over 140kmh were recorded underneath. I can attest that the winds were powerful, I was underneath that as well. The above picture was the beginning of the storm. As it turned out, even with a powerful car we were not able to outrun it. Once the storm had passed, the awards were waiting. 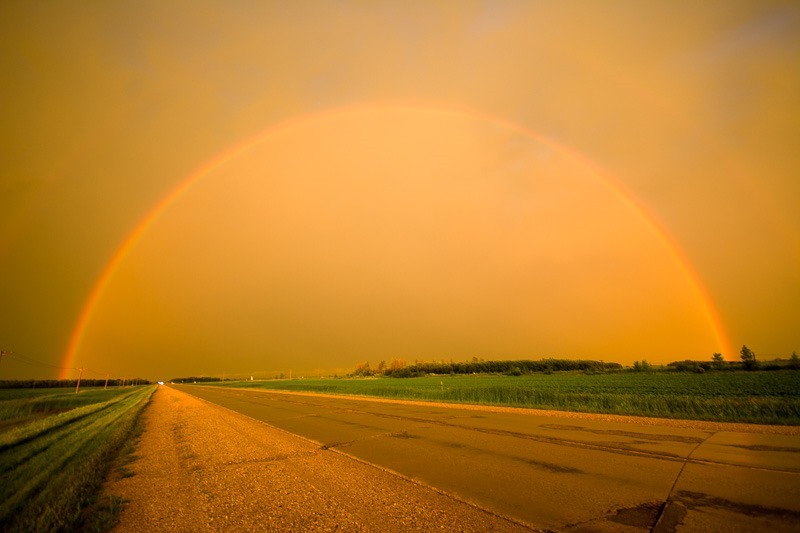 We didn’t get the pots of gold, but the rainbow was stunning beyond belief. Then camping with a friend. Going north in Nopiming Park lies a small town called Bissette. It used to be a gold miners’ town but today it seems that there is no more gold to be had. The lake not far away from the town called Beresford Lake turned out to be one of the quietest lakes I have ever seen. The above shot was taken around 7pm, not a disturbance in sight. That was not the case when we got back there around 10pm, when the clouds of mosquitoes were having a party. We left for our sleeping tent pretty quickly. 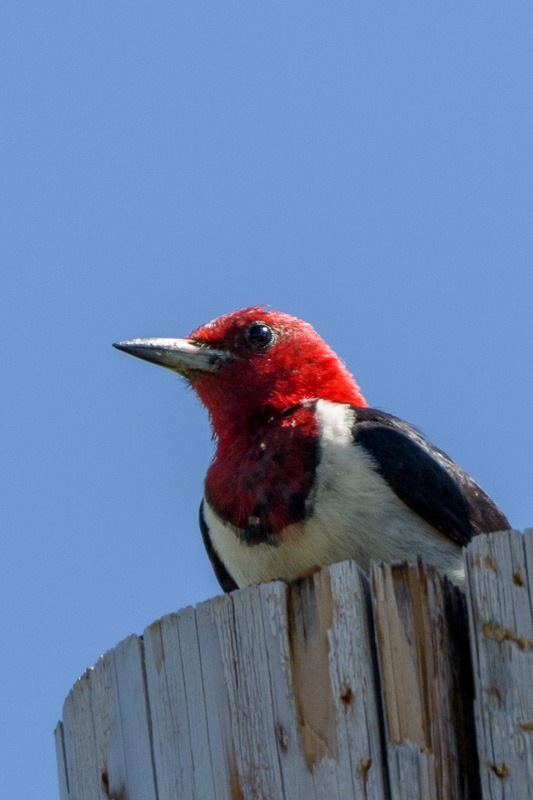 One of the highlights of my birdshots was this fairly rare Red-Headed Woodpecker. I had seen them on other people’s pictures, but never thought I would get one of them myself. While the first series of this bird were hardly presentable, this shot was worth showing. 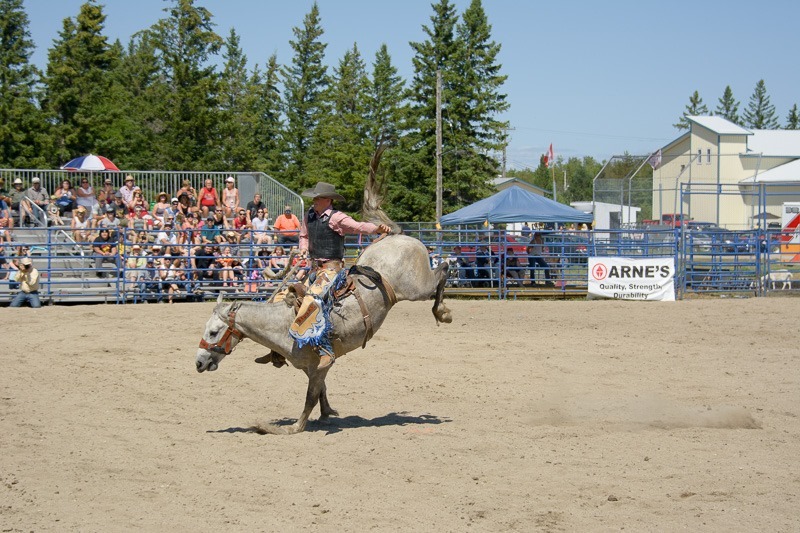 A rodeo in Richer, Manitoba. Another first for me. A rodeo with a real rodeo clown and real animals trying to keep humans at bay. Those bucking horses all won from the humans, not a single cowboy stayed in the saddle. 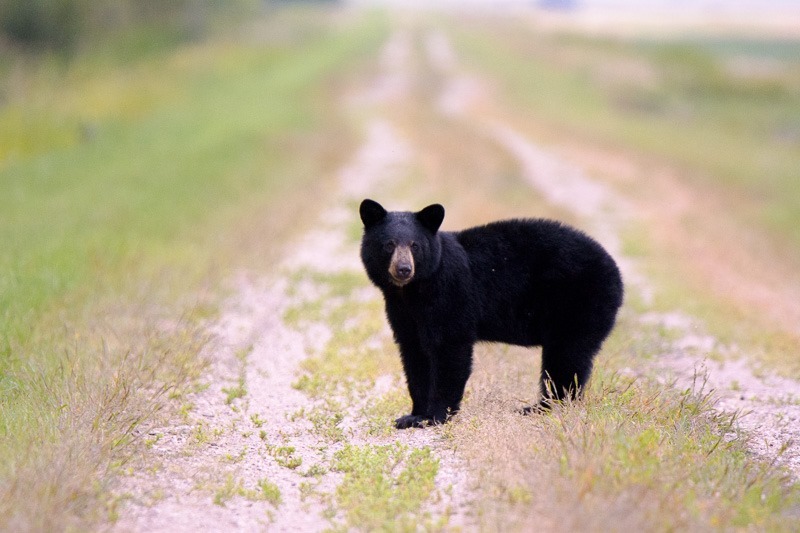 This bear popped up in the middle of a country road, right in front of the car. I have to admit that a friend and I had been looking for bears. Everybody told us that there were lots of bears in the area. Yet I still had to see my first one. A few years ago my wife and I saw one on Highway 44 but it was hardly the kind to photograph. This youngster was very curious and let us photograph him for about 5 minutes in a row. Then it disappeared in the bush beside the road. Many photographers I know have been talking about Sandhill Cranes. I hadn’t come across them, except for very far away. While others always came back with lots of pictures of them, I came back with other stuff. 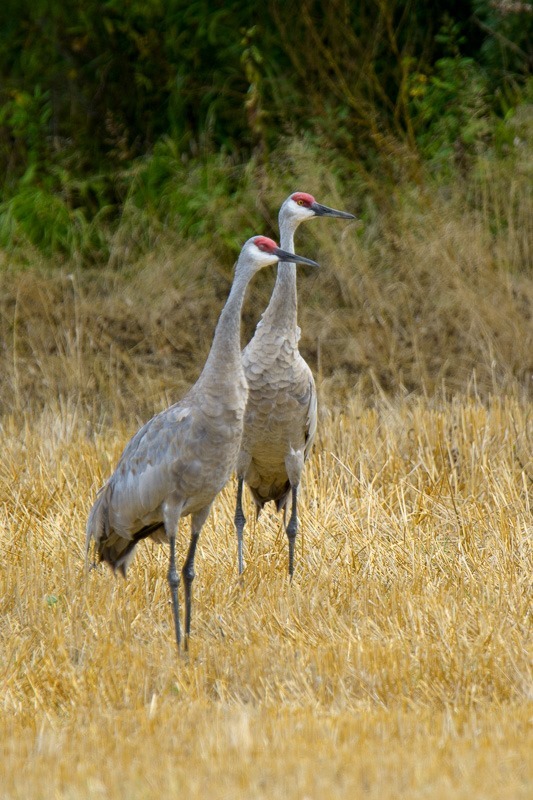 Finally this summer the Sandhill Cranes were on my menu. There should be no summer in Manitoba without hummingbirds. 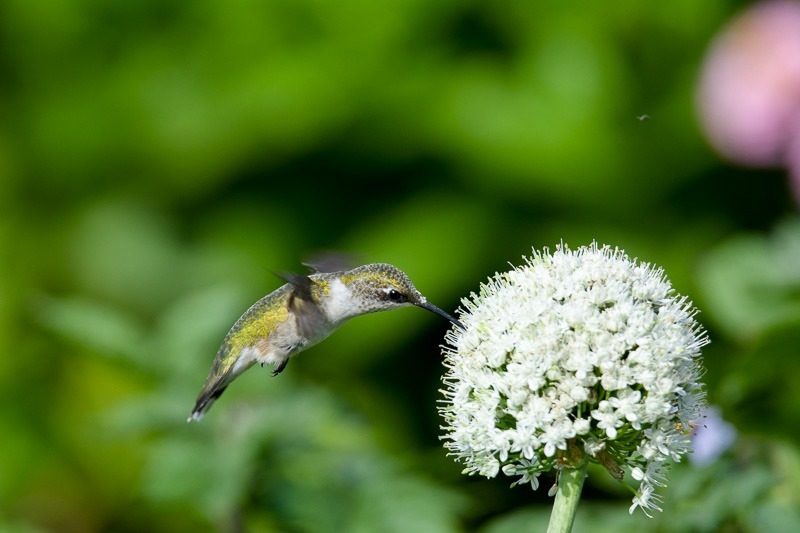 While we get only one type here, the Ruby Throated Hummingbird, they are a blast to photograph. Acrobatic as no other in the air, they can disappear from view inside of a second, leaving you with photos of empty branches and beautiful flowers. This one was feasting on the nectar of an onion. 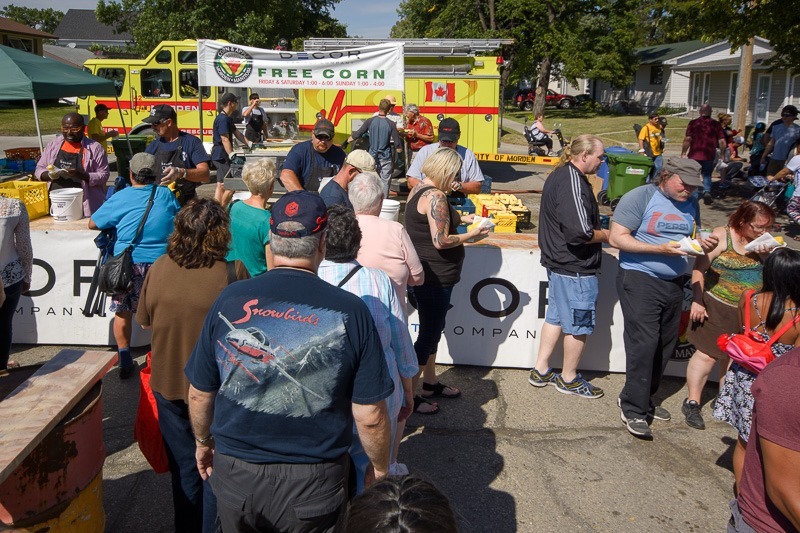 The Morden Corn and Apple Festival is another attraction in the Manitoba Summer. Thousands of people come to this city in August to feast on… Corn and Apples, of course. Some of it was even free and the lineup for this was obviously long. It was worth the wait, the corn was great. The apple juice… well, it was apple juice, sometime. The last shot of this post is the nominee for the national bird of Canada. 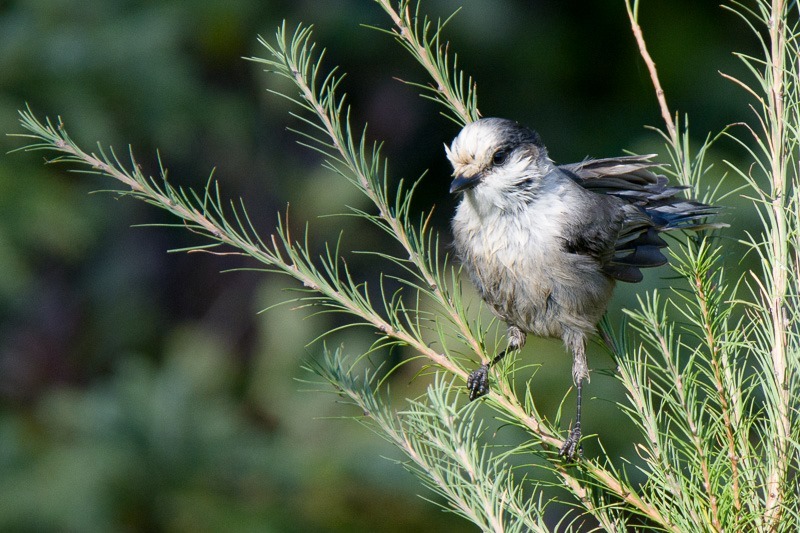 Namely the Grey Jay or commonly named Whiskey Jack. Or Whisky Jack, I don’t know what type of whiskey it prefers. We shot this one while waiting for other subjects to show up. Finally this was the only decent picture of that trip, The subjects never showed . So, How was your summer? As stated in the beginning, the summer was too short. Did you do anything to remember?